Like most kids, Cameron M. Smith dreamed of traveling among the stars. Unlike his peers, however, the now-45-year-old Portland State University anthropologist isn’t about to let his less-than-stella vision or lack of funds stand in his way. Smith plans to get balloon pilot’s license and take off into the lower stratosphere in a nylon craft of his own making. But survival at 50,000 feet requires more than a wing and a prayer. To protect his body from the elements, the would-be astronaut is building a prototype “space suit” using parts scavenged off the Internet and from his neighborhood hardware store. Smith’s first stop was the Internet, where he scrounged up a diver’s dry suit, a gauge that measures internal air pressure, and an aquarium pump for circulating cooling fluid. For everything else, he turned to Ace Hardware, which provided miscellany like nylon webbing, wire, and PVC valves. His pièce de résistance? An authentic ’80s Soviet fighter helmet from eBay that tops off the whole ensemble. 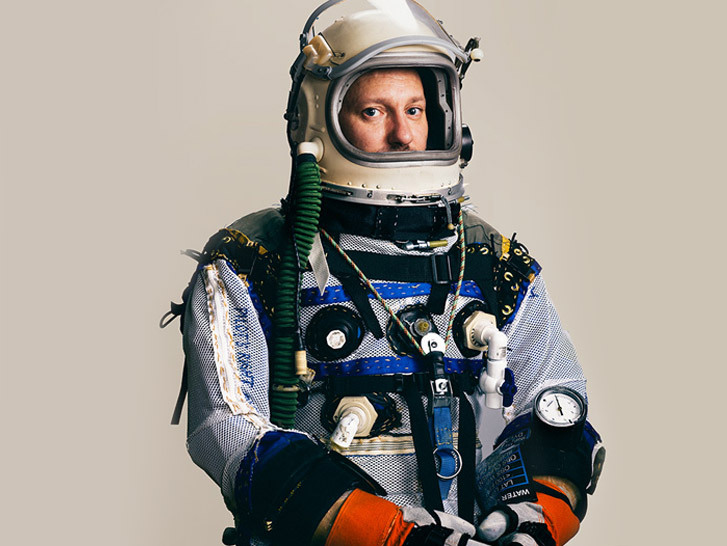 Once complete, the proof-of-concept suit still has to undergo testing in a hypobaric chamber.